Surrender at 20: Red Post Collection: Lyte on Tribunal and Ranked TB, Meddler on tentative Urgot buffs, DJ Sona Q&A on 2/24, and more! Red Post Collection: Lyte on Tribunal and Ranked TB, Meddler on tentative Urgot buffs, DJ Sona Q&A on 2/24, and more! This morning's red post collection includes a heads up that a DJ Sona Q&A scheduled for Feb 24th, Lyte discussing the Tribunal and work on a ranked version of Team Builder, Meddler noting a tentative Urgot buff they will be testing soon, a community spotlight on Man At Arm's real life Katarina daggers, and more! The skins team is hosting a DJ Sona Q&A tomorrow, Februrary 24th! "DJ Sona’s tech crew steps out from behind the curtain for a question and answer session at 12:00 PM PST on February 24. If you’re looking to go backstage with DJ Sona and the rest of the skins team, swing by with your questions! 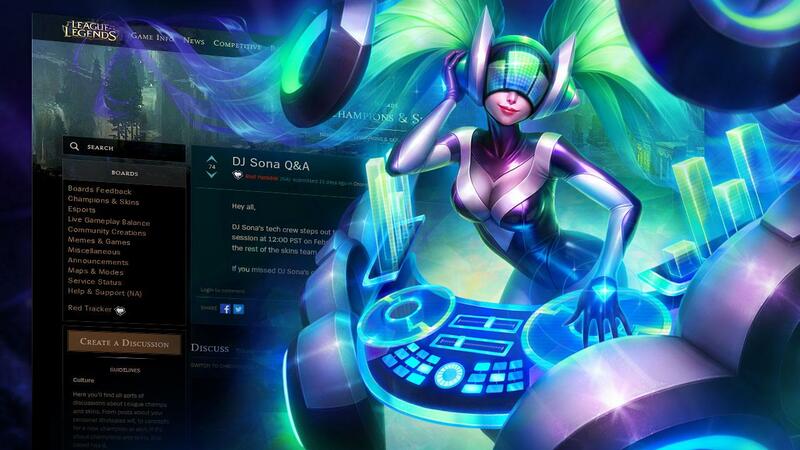 If you missed DJ Sona’s opening set, get all the details on League’s premier disc jockey here." "Every once in awhile, I see a thread like this and it's a :( day. Tribunal's been down for 9 months, and we know that's a long time. However, player behavior in League has been at record bests due to a few different systems that were implemented while Tribunal is being re-worked. 1) The new LeaverBuster has been out for 2 months now, and has pushed leavers/AFKs to a record low in the history of League. I'm hoping to share more data around this when we wrap up analyses. 2) The machine learning system has been extremely aggressive at combating racism, homophobia, sexism and death threats. Right now, these types of behaviors show up in approximately 2% of games globally. An interesting "test" is to think about your last few games, and think about the last time you actually saw someone use the "n" word, or c*nt, or similar obscene phrases. 3) There is a new intentional feeder detection system that has been banning out intentional feeders outright. We have a record low in number of players who are actually intentionally feeding (the old days of 0-20 and 5 Zeals are gone). But, this is not an excuse for the Tribunal's delay. It just turns out that re-working the Tribunal required re-working several foundational pieces of League, such as the Report System's backend, how chat logs are generated on the platform, and how websites/front-ends are created across every server. When players think of "just" re-working the Tribunal, they don't think about all these other pieces which are each complex systems. In addition to the above, the new Tribunal will have the ability for players to review positive behaviors and reward players with in-game bonuses, and some algorithmic upgrades to improve efficiency of the system, accuracy in detecting troll voters, and improves overall system accuracy. I'm happy to answer some questions for a bit tonight, but apologize for the delay in the system coming back." "We completely agree, there's huge value in the ability for players to directly contribute to the community standards, whether it's rewards or punishments. Part of the re-work is actually re-working the Justice Review (the place players can visit to see their contributions to the community overall). What are some stats that players would like to see on the Justice Review?" "Thanks for the feedback. You'll be happy to hear that we agree with a lot of it, and # of cases judged correctly, total number of cases, and toxic days prevented are staying. In addition, we're adding number of positive players you influenced (after all, it's pretty awesome to know you made someone's day!). We're currently back and forth about what to do with the Justice Rating and Longest Streaks and whether we just need to change the definition of those things to motivate players to always make the best decision instead of what they think will increase these numbers. The Tribunal's tuning was always on the conservative side; toxic players might not agree and once in awhile you used to see these players complain on Reddit, but the system was always tuned such that we'd rather err on the cautious side and make sure no innocent players received a penalty instead of trying to target all known negative behaviors. Perhaps in the future we can allow top Tribunal voters (in terms of accuracy + engagement) be able to flag cases for our Player Support if the verdicts were wrong. We'll see." Can I just say this? Leaverbuster accomplishes nothing. Like, there will always be afks. There will be fire alarms, there will be idiots who started a game 30 minutes before an appointment, these things will always happen from time to time. I don't care if these players get punished. The damage is already done. There is nothing more miserable in league than a hopeless 4v5 game. I don't care about toxicity as much as other players, I can just mute that noise. But if someone leaves, I'm still stuck in that game. If I want to leave, I will be punished just as much as the first person. That's what I want changed. I want an escape for when a game has been irreversibly ruined. Because while that leaver is off doing whatever, wherever, I'm just slowly and painfully getting pushed to my nexus. And that's not okay with me. We agree, there will always be some amount of emergency AFKs/Leavers. However, before LeaverBuster, there were a lot of intentional leavers as well; surprisingly, a lot of players came from FPS/MMOs/etc where leaving really had no penalty, so they just Alt-F4'd or left in League thinking there were no penalties for MOBAs either. We had to tackle that problem first, then it becomes a question of what should we do when there is the rare 4v5 match. We have some solutions in mind already, but want to see how LeaverBuster shakes out, and what the remaining issues are with leavers/AFKs." "We're working on a Team Builder version of Ranked that is just selecting positions. That system in particular should help address problems like the one you noted." We are locking down the final designs of Ranked Team Builder, so it's still too early to "talk about it!" "We're going to try a small mana ratio on his shield in testing soon. That was something that showed some promise when tried briefly last time we were testing possible changes for Urgot. Didn't proceed with it at the time due to a desire to focus on other things first and see what impact those had. The last set of changes certainly didn't overbuff him though, so we're going to look at it again." "I'd argue it's definitely possible to have a champion with a core identity that isn't worth keeping. This will be a bit hyperbolic, but imagine a champion that was built around the core idea of 'complete randomness', expressed through things like a passive that reads 'When attacking champions you have a 50% change to kill yourself per auto attack and a 50% chance to kill your target'. There's a really distinct identity there, but it's not one that's going to result in good gameplay. That's a pretty extreme example though of course, and one that assumes something went really, really wrong during a champ's development. Being more realistic, what we tend to see are problems with how an identity is executed on, more than problems with core identity. Old Soraka was a strong example of this. Soraka's identity has always been as the healerest healer in LoL (even if she hasn't necessarily always putting out the most actual healing). Her old, old kit however, that allowed her to spend mana to heal an ally and then top up her own mana for free, resulted in some lanes where nothing really happened. In some match ups Soraka's lane couldn't kill you, but damage dealt to her or her ADC didn't stick, resulting in low action farm fests. Our conclusion there, eventually, was that 'dedicated healer' was a solid identity it was appropriate to include, but that it needed to be done in a way that didn't nullify past action as strongly. As a result Soraka's recent rework allowed her to put out significantly more healing per second, but at the expense of her own health, avoiding stagnant lanes. Same foundational concept, pretty different execution on it basically." Comment's still there as a couple of other people have pointed out, it's been downvoted enough you'll need to click to expand it though. In case it's unclear the changes aren't necessarily 'permanent' but they are what's going into patch 5.4. Locked in this context means we've reached the patch deadline and can no longer make changes to content going out in it. We're confident enough in this direction for Veigar that we think it's appropriate to put the changes out, assess how he performs and then adjust as appropriate in following patches." Check out SmashGizmo's PBE thread for more information on the upcoming changes. When you envision the game this time next year, what exactly do you see going on in it? How do you want or expect this season to play out? We want more champ diversity. A lot of the preseason changes were made with the goal of having games play out differently. Overall we are happy with the changes made to towers, objectives and the jungle, but it hasn't yet created the space for more champs. (I should add at least within one region - if you look world-wide, diversity is preety good, but that's largely because different champs are getting played in different parts of the world.) We knew the changes would be disruptive, meaning it might take players a few patches to explore the best strategies to use in the new environment, but things are starting to settle in now and diversity isn't where we want it to be. When you refer to strategic diversity, do you mean that you want any and all champions to be a common and regular pick, their frequency only truly decided by their teamcomp? Or are you perfectly happy with the way things have traditionally been, with people generally flocking to the same 3 or 4 champions for each role outside of edge cases and "pocket picks," so long as there is some other form of...strategic diversity in another way? And if so, what is that strategic diversity, if not champion variety? Strategic diversity refers both to champs and to the game itself. If every game is won with a similar comp (even if the champs are different) or every games be becomes a 5 dragon stack, then the risk still exists that the third game you play feels exactly like the previous two. On the topic of champ diversity specifically, it's not a reasonable expectation or a goal to have every champ played equally. Champs have different play styles and themes and that all factors in. But we can do better than we do today. How exactly do you plan on dealing with mobility creep? Do you even think it's still a problem, or should we just expect every low-mobility character to eventually be reworked to keep up? If you're planning on doing something about it, but it's not going to be for a long, long time coming -- could you just tell us? Please? Mobility is fun and useful or we wouldnt't keep adding it to kits. The problem is that too often it comes for free just to give a champ a little extra pizzazz. Roles that need a lot of mobility, like assassins, aren't a huge problem, but roles that already bring a lot to the table, especially mages and ADCs, can be. Even with these it doesn't need to be an ironclad rule that they can't dash, but they do need to pay for it elsewhere in their power budget. For these champs, we are less likely to nerf their movement mechanic and more likely to reduce their damage, survivability or control to pay for the mechanic." The jungle is a complete mess. So much so that few people anymore want to even touch it and you have been forced to implement some PBE stat giver device to try to get players to play it more and give you more info. That you say you are overall happy with the jungle is pathetic. Tier 2 turret shields are as terrible mechanic that need to go. It randomly nerfs certain champions and is a terrible way to deal with poke comps. I swear if Riot would just allow some time and space for PLAYERS to find ways themselves to deal with problems instead of halfass poorly thought out quick fixes like turret shields, this game would be so much more interesting. As a whole your playerbase is infinitely more innovative than you Riot but you rarely give us the time or chance to show it before rushing in to enforce the meta with some stupid quick-fix. We are constantly following up on the state of the jungle. Turret shields also have changes on the docket for 5.05. Giving players time to figure out changes could be construed a number of ways. Should we not change the jungle, and leave Turret Shields exactly the way they are such that players innovate around those changes? I frequently think about and ask others in the office: what would happen to the game if we (Riot) took our hands off the wheel for a year? Would it be a better or worse game? Undoubtedly, players would innovate and we'd see some very creative meta manifestations. Overall, though, I'm confident that we do more good than harm with our updates." "It is fair criticism that we overly focus on the jungle and not on the champions. I would say (as someone who works more on the jungle/systems side) we believe that the jungle can be a place that caters more favorably to tanks and that is something we have not yet delivered on." "Rapid fire questions! I'll hit some of them that I have strong opinions about. How do you feel about people saying that towers are too weak? I can understand why people feel this way: we have a lot of tools available in the game to destroy turrets quickly. Full tanks, which are pretty common, can also sit and tank a lot of turret shots. However, I'm fairly confident that turrets are just all around stronger than they were before the season swap. So much so that it might have deleterious effects on the game as a whole. This is actually the most troubling mismatch of perception to power for me in the game at the moment. How do you feel champ diversity relates to the LCS? The LCS (and pro play across the world) impacts player perception and thus play rate pretty dramatically. 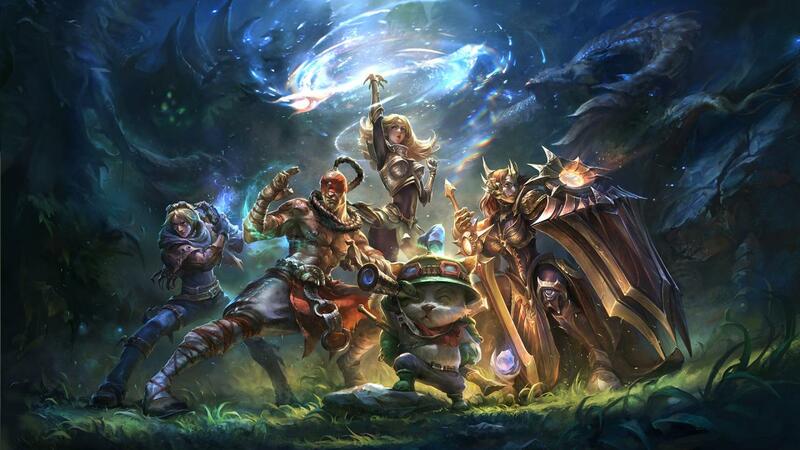 It is hard to imagine a world where pro play has little diversity but common play does. This makes it tricky, because pros have a lot of legitimate reasons to not add a ton of variety into their play. They often use picks to steal away high priority champions from the enemy team. Teams, imo, also get advantages by practicing with similar squads in repetition, so 'surprise' picks are less valuable. Are you ok with the same champions being played most of the time? Is that the result of pro players or balance issues? I definitely want to see more diversity. I think even if we get champion diversity to a state where it's "okay" in our view, we'll still see some repetition in picks. I think balance issues are the primary culprit, though there have been some cases where professional play stubbornly would not adopt certain champions and held onto others too long. Do you really think mobility like Kalista and Yasuo are good for the game? They're the most free along with Lee but Kassadin's the one who got nerfed. Just wanted to touch on one point here: while they are 'free' in the sense that they don't cost a resource most of the time, they are much more conditional than Kassadin. He has freedom to move any direction he wants. Yasuo can only dash into enemy targets, Kalista needs something to hit to access most of her extra mobility. To that end, they're probably more healthy." "I probably wouldn't be the one to give insight to CertainlyT for her future balancing. I don't have particularly great insights into her play. That said, Pierce is one of the things I would be least excited to see changed. When he was in ideation he got me into a conversation about her. He asked, (paraphrasing of course) "shadow isles evil-ish marksman, what weapon do they use?" I said spear. He said he'd already settled on that but was just making sure it made sense. Then he was like, "when you think of a spear thrower, what excites you about what they do?" My response was that I really liked in movies when the character launches the spear after throwing their whole body (jumping) into it. The extra momentum really sells the use of the weapon for me. I think Pierce sells that fantasy the most for me. In her development she also would do more damage when moving forward with her passive, which I thought made a lot of thematic sense." "There's a bug at present, introduced in patch 5.2 or 5.3 I believe, where spellshields won't block the damage of spells that apply on hit effects (GP Q, EZ Q, MF Q, possibly some others I'm forgetting). We've got a fix for that in the next patch." Last up we have MAN AT ARMS crafting a physical version of Katarina's daggers! "Watch real blacksmiths from Baltimore Knife and Sword make working replicas of Katarina's blades!"